We are passionate about the role technology can play engaging today's modern workforce. We could write about the new agile world of work and the rise of HCM Engagement Platforms all day long (we are geeks that way)! If you share a similar interest, grab a cup of coffee and browse through our library of Videos, eBooks, Infographics, Publications & Webcasts on the topic! If you would like to have a chat, just drop us a line. We’d love to hear from you. Examples showing how innovative, talent-driven organizations are using engagement technology to drive business outcomes. Introducing Vibe HCM - HCM + Engagement. 1 Platform, Any Device. 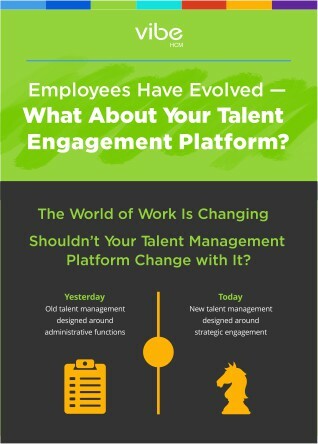 This infographic (and accompanying eBook) explore the latest business trends impacting talent Management. We introduce 10 new approaches for consideration as you think about transitioning from managing talent to engaging their hearts and minds. This Q&A explores what Progressive Web Apps (PWA) are, how they drive adoption, and how they differ from responsive web design and native mobile apps. Future implications for PWA in HCM applications are also discussed. 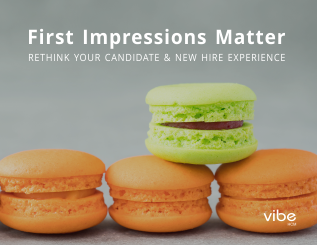 In this eBook, we explore the importance of making a good first impression with job candidates and new hires. In the digital age of social media and employer review sites like Glassdoor, job candidates and new hires are rapidly forming opinions about your organization. Without a clear employer brand strategy and an engaging candidate and new hire experience, your organization will find it increasingly difficult to attract and retain the best talent. You may already understand the benefits of a highly engaged workforce - increased productivity, lower absenteeism, and better talent retention. You may even be surveying your employees to measure their engagement. Or, like many companies, you may be turning to niche solutions, such as rewards and recognition or employee wellness, to improve employee engagement. But you probably never thought about your core HCM system as a platform to engage your workforce. The platform your employees need to access on a regular basis for payroll, benefits, or company communications may be the most powerful tool to achieve employee engagement. So how do we move beyond the buzzword of engagement and start to truly impact employee engagement in a systematic, sustainable way? In this interactive Lightpaper, we'll dive deeper into employee engagement and uncover strategies for how companies can leverage HR technology as a driver to achieve this imperative. This report represents the major findings in primary research conducted by Aberdeen Group on the use of social in organizations and is based on responses collected from 244 organizations between April and May 2015. The purpose of the study was to take an in-depth look at the internal use of social technologies in organizations in an attempt to understand the maturity of its use, identify barriers to its adoption, and demonstrate the impact social can have on organizational outcomes such as engagement, retention, and customer satisfaction. This report illustrates how organizations that embed social into HR processes and deploy an HCM with full social capabilities are poised to capitalize on the collective intelligence of their employees, resulting in higher levels of organizational productivity and revenue. This Knowledge Brief discusses the importance of social capital as a valuable organizational asset and the role that technology plays in facilitating higher levels of social capital through systems of engagement.